Home » Academics & Resources » Art, Music & P.E. At North Florida School of Special Education, we believe that creative arts and physical education are essential to our students’ development. We are dedicated to unlocking the world of possibility inside each of our children by offering extra-curricular programs in the form of Art, Music and Physical Education classes built in to the school day. Vincent Van Gogh once said that “There is no blue without yellow and without orange.” This idea of the connectedness and unity found in variety embodies our art program and our school. In the art room, we see our students breathe life into their dreams, growing in confidence and becoming more self-aware as they produce vibrant pieces of artwork. Encouraging the non-verbal creative process is essential for children with special needs, who often struggle with self-expression. 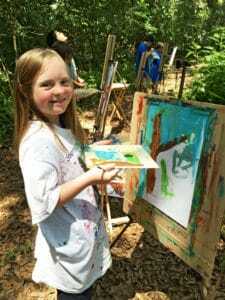 The students at North Florida School of Special Education create breathtaking art, in a wide range of mediums, which is sold at various events and fundraisers throughout the year. The proceeds go towards the art program and the school as a whole. For more information on our program and how you can help, please contact Jill Morrow at Art@NorthFloridaSchool.org. Music is often lauded as an incredibly beneficial therapeutic approach to address the social, physical, cognitive and emotional needs of children with intellectual and developmental differences. At NFSSE, Music class provides a safe haven for our students where they can focus on moving, participating and positively expressing their feelings without any pretenses. We have seen our students uncover new avenues of communication through song, dance and the releasing of inhibition. 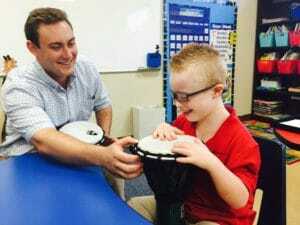 Music is truly a multi-sensory experience and powerful form of therapy that motivates our students to connect with each other and with themselves. Adaptive Physical Education is another tenet of NFSSE’s enrichment program that is crucial in the continued development of our students. At North Florida School of Special Education, we have seen the power of movement and physical activity tremendously benefit our students in a myriad of ways. Our Physical Education classes focus on the development of fundamental and physical motor skills through endless activities, games and challenges, each differentiated to the participating student’s needs. Most importantly, our students are encouraged to have fun and play in a way that is commensurate to their pace and ability.